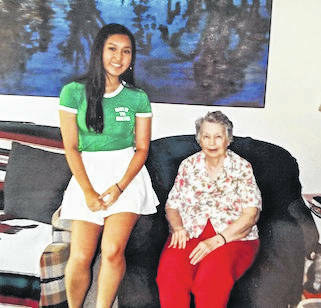 At left is Japanese exchange student, Akine Ishiwatari with Marlene Heimlich. The two met before Akine returned to Japan a couple weeks ago. This is the first photo Hisae sent to Marlene in 1950. 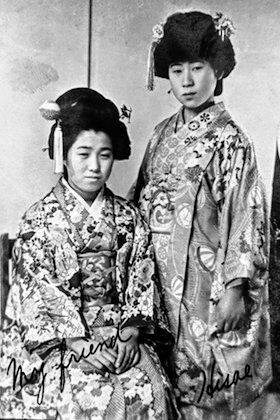 Hisae is on the right and is with a friend. Letters, photos and memorabilia from 69 years of correspondence. 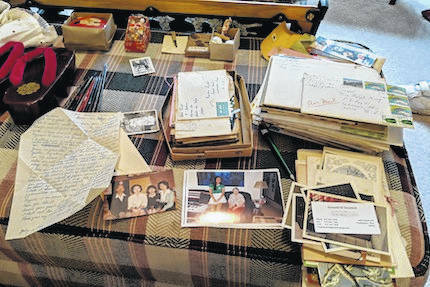 MOUNT GILEAD — Marlene Fricke could hardly have imagined that her first letter to a Japanese pen pal could lead to a 69-year-long exchange of letters. Marlene Fricke Heimlich said the correspondence began when she was 13 and her teacher in Cardington, Mrs. Patterson, gave the students pen pal names. She thinks that at the time they were trying to smooth things over with the Japanese following World War II. The first letter Heimlich received from her pen pal, Hisae Utsugi, is dated Feb. 13, 1949. That was just four years after the end of World War II when the atomic bomb was dropped on Hiroshima, Japan. Hisae’s handwriting is very clear, although delicate, and her English is very good and easy to read. Hisae was 17 years old and a sophomore in high school. She was taking a number of college preparatory courses that included chemistry, geometry, English and physics. Most remarkable is that the letters continued faithfully back and forth between Hisae and Marlene over the years. There is a pile of letters 10 inches high and many photos and souvenirs that were sent from Hisae. It is interesting to follow the sequence of life events in Hisae’s letters. She went to the university, got married, had two daughters and taught English for many years. She sent along a photo with many events as her children grew up, got married and then grandchildren began to arrive. Marlene also sent photos of her children and grandchildren as her family grew. A major life-changing event was when Marlene’s first husband, Ralph King passed away. He was in the Air Force when they first married. After his death, Marlene began working as secretary at St. John’s Lutheran Church Windfall, where she worked for 20 years. Marlene later married Ken Heimlich, whose wife had also passed away. She had three children in her first marriage and Ken had five children. Together they have 22 grandchildren and 23 great grandchildren with one great-great grandchild. Marlene says most of the letters between her and Hisae are about their family and children. Marlene was surprised that Hisae told that the Japanese ruler had attended the coronation of Queen Elizabeth. That was in the 1950s. “We both stayed away from politics and anything controversial,” Marlene said. Lately they have written some about health matters. In her last Christmas letter Hisae apologized that her letter was late. She wrote that her husband had lost his voice due to cancer and that her brother had recently passed away..
Marlene is concerned because it is more than a year since she received a letter from Hisae. She said this past Christmas was the first time she had missed a year. Marlene and Ken were happy to meet the Japanese exchange student, Akine Ishiwatari who lived with Mike and Kim Porter in Mount Gilead this year. Akine came to their home a couple weeks ago and they enjoyed their visit with her. 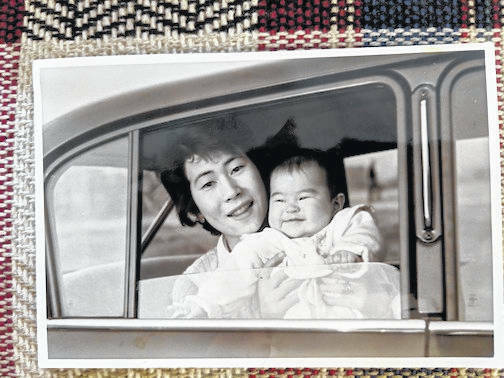 Marlene said Akine will check to see if she can find information about Hisae and her family when she returns to Japan this month. This correspondence has been an important part of Marlene’s life over the years. She wonders what will happen to the letters, pictures and memorabilia when they are both gone. The numerous letters and photos are a living history for the two women.